Primary 7 were successful in applying for a grant of £750 from SOS (Sense Over Sectarianism) to purchase educational resources to support the teaching of anti-sectarianism. We were able to purchase over 100 copies of Divided City by Theresa Breslin. 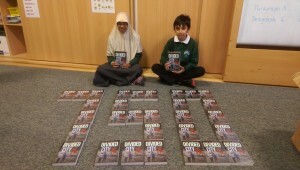 That’s one copy per child at Primary 7 to support our novel study which accompanies our SOS workshops and class topic.